In Illinois, law enforcement personnel are authorized to use tasers under specific conditions. Unfortunately, even when used properly, you could suffer severe taser injuries. If you suffered severe taser injuries, even if during a lawful arrest, I can help you pursue compensation. Call me at 312-322-0077 to discuss your case. 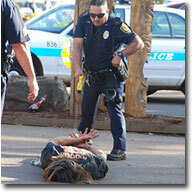 Unwarranted or abusive taser applications by police officers are considered civil rights violations. As an attorney who focuses on representing victims of civil rights violations, I understand how to formulate skilled trial strategies. Police officers are trained to use tasers the same way as handguns, effectively aiming for your heart. Improper application can lead to death, serious bodily injury and significant medical problems. You could face expensive hospital and doctor fees, along with loss of income. Tasers can be lethal, even when police use them correctly. Police are liable when they use tasers improperly; the taser manufacturer may liable merely for making and selling such unreasonably dangerous weapons. As your lawyer, my goal is to help prove liability so you can receive suitable compensation for your taser injuries. I can gather data about the taser and manufacturer to establish of liability. I can also discuss your medical condition with your doctor to help determine your long-term medical and financial needs. If a settlement offer is not sufficient or not in your best interest, I can take your case to trial. Please call me right away to discuss your case. You can reach me at 312-322-0077.